earlier today i posted a question about refinnishing a savage thompson. I hope these pivtures help and that everyone enjoys them. There are more posted at my thompson. i was very lucky to inherit some full auto weapons, and I am trying to learn about them and give them the best care I can. I have been reading the board for a while and even went through the entire archived board. Needless to say I am learning alot, but still have a ways to go. Any information any one can provide is much appreciated. Nice pictures of your gun. I agree with your earlier post, it does look like it has been parkerized. By the way, the grip frame is not original to the gun. The receiver is a Savage made gun indicated by the S prefix on the serial number. The grip frame is an Auto Ordnance made frame indicated by the words Full Auto appearing on one line. This is characteristic of Auto Ordnance made guns. Check the serial number on the bottom of the grip frame under the buttstock and it shoud be prefaced with an AO- then the serial number. The gun was probably rebuilt at some point and a different grip frame installed. This is common on WWII guns. I'm no expert but, the broad arrow mark does indicate that your guun was in British custody at one time. 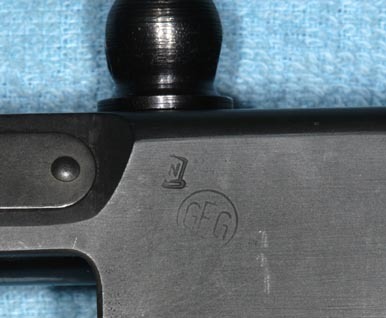 The "GEG" stamp says the gun was inspected by George E. Goll of Auto Ordnance at some time. The mark w/ the "N" I dont know. I'm sure other have further knowledge of this gun. It is a beautiful firearm, do not change a thing on it or you could destroy it's potential value. The no cross bolt stock would indicate a early gun in WWII. With the rear sling swivel on the top would indicate British also. But I would say the stock can be replaced at the click of a button. It is a low serial number.It could be a gun purchased by the Brits before the lend-lease program, early Savage models lacked the US and A1 stamp by the serial number. Frank Iannamico's book "American Thunder" has a couple chapters about these guns. Great info. If you want great detail about military Thompson's,. get Franks book. Congratulations on the inheritence of such a very nice firearm. Take care of it and welcome to the board. If you have a question, feel free to ask anything. it's the only way to learn. Very interesting! 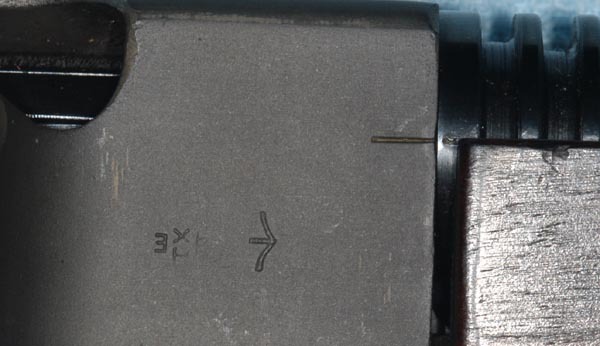 It appears to me that the grip frame number may have been restamped to match the receiver. It looks like there me be a slight recess where the old number may have been ground off. The stamping looks like the original type with the periods after the A.O. I wonder if it was done at the factory? Maybe Frank Iannamico has a theory on this one. I agree with Mike, it is obviously was a British gun, i.e. British proof marks, sling swivel relocated to the top of the buttstock, etc. At any rate it is a nice gun. Do you have any idea when the gun may have been refinished? It don't know if the British would have parkerized the gun. My guess is it was done when the gun was imported back into this country. no idea on the refinnish, the date on my relative's ATF paper work is in the early 80's. So i don't know its history before that. With all the machine guns in the US registered, is there a way to research who has had possesion of the gun since it was orignally registered? Michael the BATFE data base is not open to search the history of your gun. Since this is a Federal tax matter the information is privledged. Has to do with the $200 tax paid at the time of transfer. I agree the lower serial # has been ground and renumbered to match the upper. I am not aware Auto Ord did this even after the war. The gun does not appear to be an import as there are no import markings that I can see. Probably has an interesting history. Enjoy your new found prize. I would not refinish the gun. Michael: Nice photos and beautiful 1928. 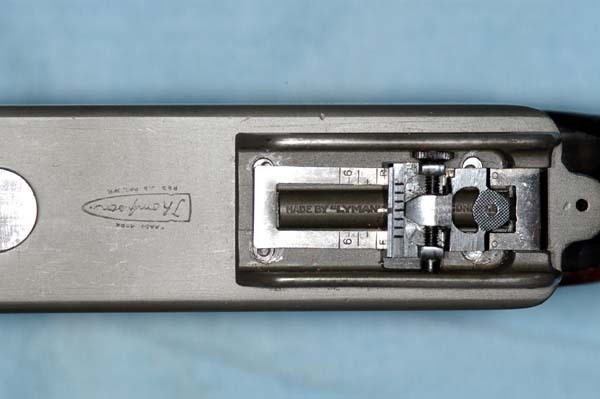 Is the top of the receiver stamped "Tommy Gun" near the rear sight? I notice that the "N" marking near the GEG acceptance mark occupies the spot where the Ordnance "bomb" is usually located. Could this be the British nitro-proofed mark, factory applied? The other US acceptance mark normally found, RLB, would be missing entirely as the gun was produced for the British under contract, most likely in 1940, before Lend-Lease shipments began. hawksnest - there is NO "tommy gun" stamp on the receiver. The British stamp I am familiar with is a small 'BNP' , inside an oval too i think- at work, can't look at my rifles. British Nitro-Proofed. 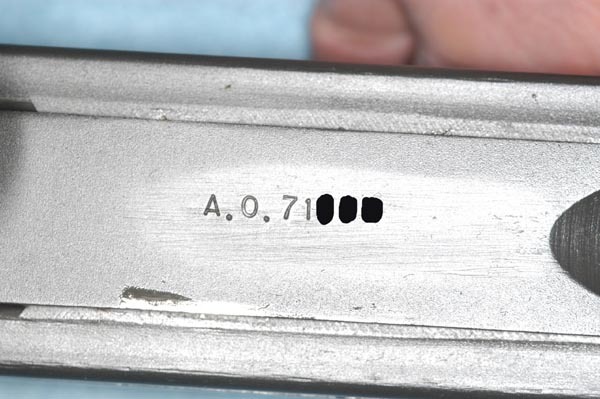 The markings on the right front of the receiver are indeed the British proofs indicating the inspector (X1) and that it was inspected at Enfield (the sideways E). It appears that the N mark on the left side is partial (not stamped straight on). It could indeed be a British Nitro Proof, as they had several variations of that proof mark. Based on your serial number and the list of guns shipped (from Frank's book American Thunder), it appears that yours was probably made during March 1941 before Lend-Lease took effect. That is consistent with the markings on your gun. I can only hazard a guess on the semi-matching trigger frame. It does appear that the original numbers were ground off and replaced. It is possible that this was done at the factory or by someone that did not recognize the difference between S- and A.O. serial numbers. This is all conjecture. You many never know the true answer. Judging from the uniformity of the finish combined with its pedigree, there is certainly a possibility that this gun has been refinished, though I cannot be certain without direct inspection. There also seems to be an absence of the U.S. rebuild markings, which would imply that if it was refinished, it was not part of a U.S. arsenal rebuild. All in all, you have a beautiful early WWII Thompson that obviously spent time in British servide. Everything is consistent with that history. Enjoy your good fortune to own this very nice piece of history! Take good care of it. For the answer to the “N” question, go to page 67 of American Thunder and discover the W-Crown proof from the Netherlands. 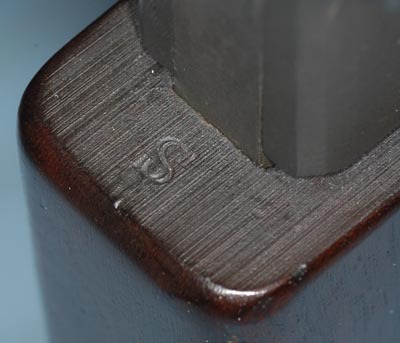 Your gun was simply not stamped straight (not uncommon) and the W looks like an N.
As for the numbers on the frame: All of those that I have seen were deeply embossed and their removal would be obvious for the amount of material that would have to be disturbed. It is difficult to be sure from the photo but I don’t see the depression that would be left from such removal of a previous number. Two seconds with the part would tell. I would not refinish this gun. The fact that the barrel is blue and the rest Parkerized is not troubling in the least. Man! What is it with these comments about "russian" smells and stuff. I've been getting emails from this guy Ltcboy asking if the piece came from "uncle yurri" and links to sites all in russian with a picture of a thompson. I tried emailing back telling him this wasn't the case. I thought I had seen the end of it and now this. What gives, why all the rudeness via email and now this comment and no explanation. Everyone here has been nice and full of helpful info, Ltcboy what do I have to do to get you to lay off. Anything less then scanning the ATF papers and posting them. Why would I post to this discussion group, who takes such care in doing everything legally and with the best intentions, some sort of improperly possessed thompson. Don't worry about it. Most of the members on this board realize that the gun you have has a British pedigree. Most 1928 models (not 1928A1) were part of the British contracts prior to Lend-Lease. The later Lend-Lease guns were stamped 1928A1. You have an early receiver that was obviously part of a British contract, hence the British proof markings. The A.O. 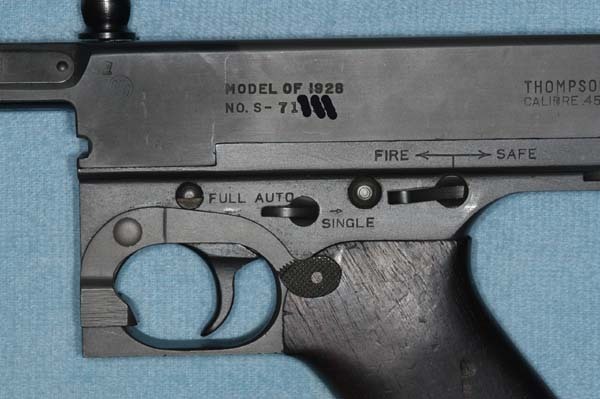 grip frame was obviously put on the gun much later since Auto-Ordnance didn't get their own facility operating until late in 1941. Your gun may have been rebuilt by British armorers or ot may have been done (and parkerized) when it returned to this country. The ATF Form from your relative should indicate when the gun was last registered and might give a clue as to when it was reimported or maybe registered during the 1968 amnesty? A gun from a former Soviet Union territory mormally wouldn't have British proof marks and would likely be a Lend-Lease gun marked as a 1928A1. Where does the Netherlands connection (as witnessed by the Crown-W proof) come in to the picture? Good question Paul! I guess I didn't read the previous posts closely enough. I stand corrected on the British proofs. I guess I was paying too much attention to the relocated sling swivel on the buttstock. At any rate, I don't believe the gun came from a Russian territory. There are some pictures in Frank's book of guns sent to the Netherlands. I don't recall if they purchased them directly from Auto-Ordnance or not. I would guess they did since the gun is an early 1928 Model. Michael, does the address on the other side of the receiver have the Auto-Ordnance New York, N.Y. address? It probably should since the gun is marked as a 1928 Model. Awesome gun! I agree with previous posts that the gun does not probably sport its original finish. I write from the Philippines and own a restored 1928A1 Thompson. During the restoration, the gunsmith applied a parkerized finish that makes my gun look almost identical to yours. where can I order Frank Iannamico's book "American Thunder", i think I saw on this web site that it is sold out. Is this the case, are more coming?